By Don Alsafi. So: Iceman. Bobby Drake. I’ll admit, the character felt like an odd choice to be given his own ongoing title. He’s a founding member of the original X-Men, sure, but every other founder has seen fairly massive changes over the years, while Iceman’s character never seemed to go much further than his original conception as the class clown. The joker. Except now? He’s gay. And, as an adult, he’s only now starting to accept that about himself. If the writing weren’t up to par, this enterprise would come across as artificial, or a stunt. Fortunately for us (and for Bobby), the comic really delivers. All the Bobby you can handle! One of the odd things about this comic is that there are actually two Bobby Drakes. There’s the Bobby we’ve always known, and the Bobby who has come to the present from the past. This bizarrely complex time-travel detail (left over from Brian Michael Bendis’s All-New X-Men run) is the one element I was most worried about, and yet it’s introduced in this issue with surprising simplicity and grace. “Speaking of,” older Bobby tells us, “there’s a time-displaced young version of me here in the present, too. He’s a cool guy.” What could have been an overly complicated (and downright weird) plot point is simply brought up, acknowledged, and accepted. The book moves on successfully without alienating any new readers. As the story opens, we see Original Bobby taking his first steps into a brand-new world of dating, training with his younger self, and subsequently rushing off to visit his father in the hospital. While there, he saves a young mutant girl from becoming a victim of a hate crime and offers her some parting words of encouragement before returning to his parents. Of course, in the time-honored tradition of parents everywhere, they fundamentally don’t understand him, even as an adult. After last week’s distressingly lightweight Cable #1, the density of story told in these twenty pages is impressive. The best creators for the book. 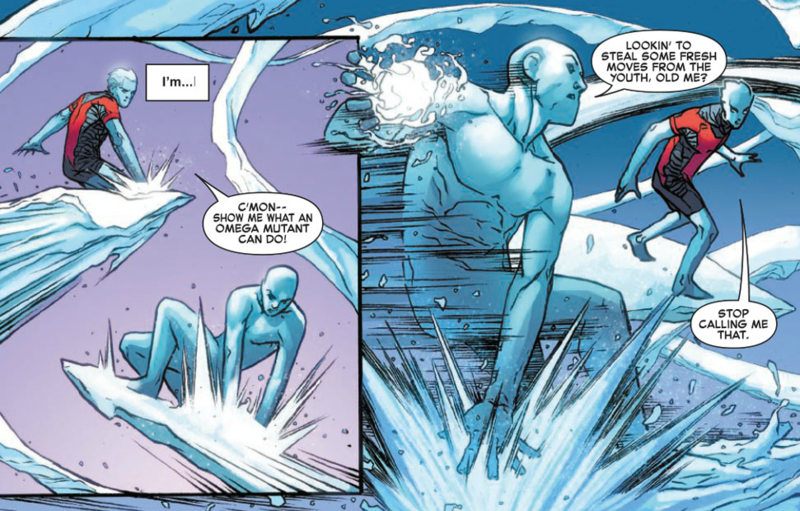 Iceman #1 is written by Sina Grace (also, one notes, a gay man), who has worked on his own properties as well as those from other publishers. He’s been both an author and an artist, and that understanding of both sides of the divide might be one reason why this first issue is such a satisfying read. Many comics writers give the impression they’re crafting a slow-burn, 800-page novel, with little thought as to the single-issue experience. On the other hand, someone who’s spent countless hours drawing every darn thing he himself has come up with is far more likely to consider the economy of the comics page, and just how precious such limited real estate actually is. Illustrating the comic is Alessandro Vitti, whose most widely-read work to date might be Jonathan Hickman’s Secret Warriors some years back. His superheroics are serviceable, with the only potential weakness being in the depiction (ironically enough) of Bobby’s ice body and ice effects; in those, there’s a slight roughness that looks almost unfinished. On the other hand, the character expressions and interactions are where Vitti’s work absolutely shines – and, in what proves to be a very character-centric comic, these are exactly the kind of strengths you need. Old is new again. With the current setup for this book, Sina Grace is deliberately writing against reader expectation, giving us far more complexity than has usually been afforded to this previously slight, one-note character. Having a second, younger Bobby in the cast paradoxically means that the adult Iceman – having always been the youngest of the original X-Men – is now perceived as Old Bobby. This is a delightful contradiction that even he seems unsure how to handle. It only adds to the questions of identity with which he is currently grappling. While he attempts to navigate the dating scene and explore his newly-accepted sexuality, we also find Bobby struggling (somewhat) to preserve his sense of youth. And yet when Bobby connects with both the girl at the hospital and his younger self, we see him providing insight born from the wisdom of maturity. He genuinely comes off as a mentor to both of these kids, automatically, instinctively – and, in fact, far more effectively than we got to see from Jubilee taking on a similar role in Generation X #1. An X-Men comic that’s actually about something. The theme of this comic is that of acceptance, and it’s one that’s conveyed on multiple levels. This shouldn’t be so surprising to see in an X-Men comic – and the fact that it is perhaps points to what’s been so lacking in the X-titles for so long. 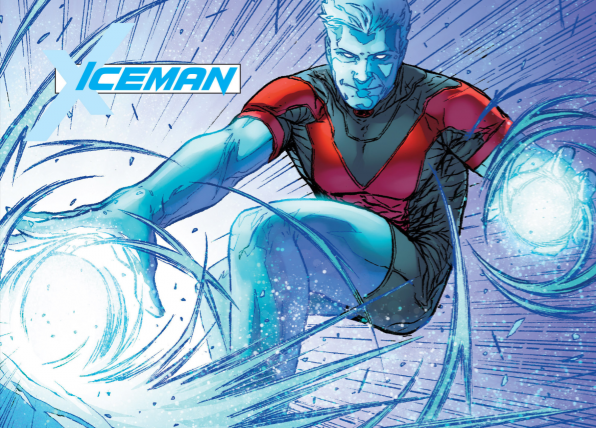 Iceman has been around since 1963, but the character has only come out as gay in the last year or two. This development might have annoyed some old-time readers, but the retcon totally makes sense when you think about it. After all, the closeted gay experience is something that still exists, and many still wrestle with it before they can fully come to terms with who they are. Shouldn’t comics readers also see someone they thought they understood turn out to have hidden depths? It cannot be overstated how much our new understanding of the character works here – nor how perfectly it plays into the preexisting themes of the X-Men. Historically, Marvel’s mutants have stood as a general metaphor for feeling like an outsider, or more specifically, the struggles a person can contend with as a member of a minority. In the 1960s The X-Men was often perceived as an allegory for racial tolerance and civil rights, and the shorthand for how Professor X differed from Magneto was frequently described as akin to that of Martin Luther King and Malcolm X. That said, the X-Men have become an apt metaphor for the gay or queer youth community in recent decades. (Mutant powers – and the corresponding change to one’s identity – often arise at puberty, and you usually can’t tell if someone’s a mutant just by looking.) This X-Men comic, where the main character comes to terms with his own homosexuality while also guiding a younger generation towards the acceptance that it’s okay to be a mutant, really is an amazing confluence of character, theme and concept. The couple of X-launches we’ve looked at in past weeks haven’t been the most successful, which is disappointing. Iceman #1, on the other hand? This feels exactly like the kind of X-Men comic we’ve been missing out on. 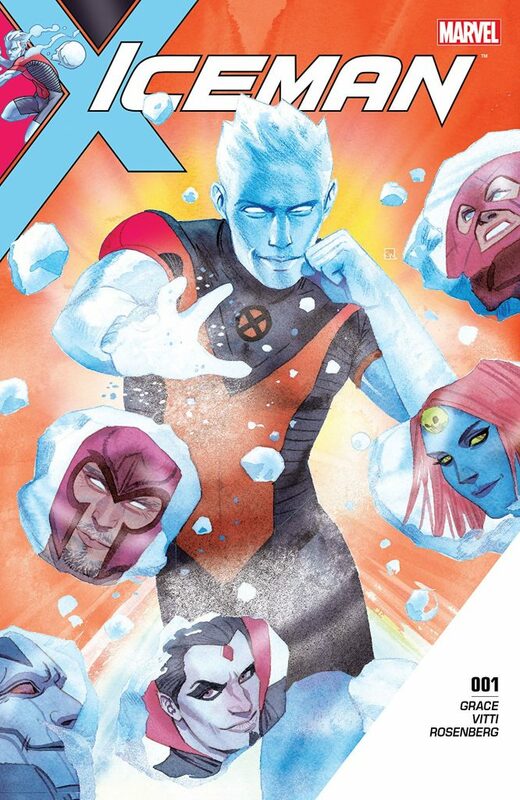 What did you think about ‘Iceman’ #1? Let us know in the comments below!